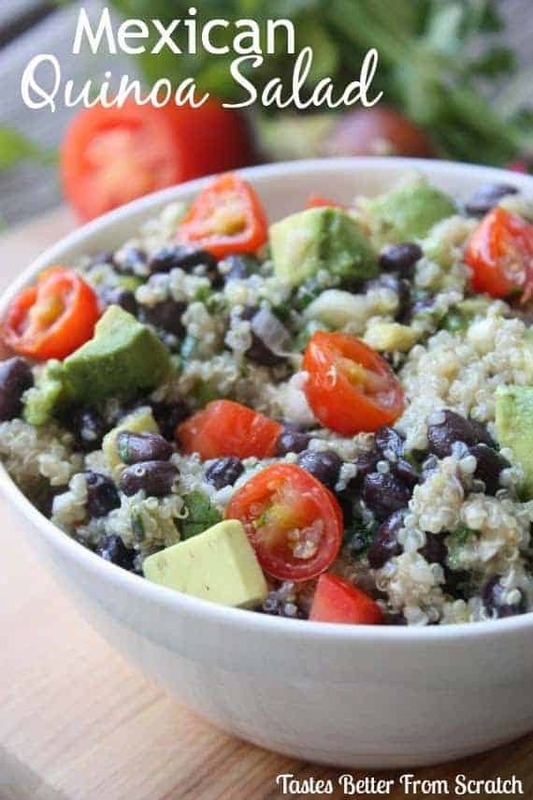 This healthy Mexican Quinoa Salad recipe is served cold with black beans, avocado, cherry tomatoes, black beans, and cilantro. I have to give full credit for this recipe to my best friend, Alison Linthorst! She made this for a bridal shower she threw for my sister and everyone there fell in love with it! It’s by far the best quinoa salad I have had! Since then It’s become a staple at our house. Sometimes I’ll add mango or some grilled chicken or shrimp to make it a heartier main dish. Quinoa is protein-rich and has lots of fiber and iron. It’s also gluten-free which makes it a great choice for people gluten food intolerance! It’s a great alternative to rice and a fun way to mix up your meals. The ingredients in this dish are so fresh and healthy, and it’s absolutely delicious; a win-win in my book! Cook quinoa according to package directions. Once cooked, let cool for 10-15 minutes. Transfer quinoa to a large bowl and fluff with a fork. Add to the bowl black beans, tomatoes, green onions, cilantro and avocado. In another bowl whisk together olive oil, lime juice, cumin, and red pepper flakes. Add to quinoa mixture. Season with salt and pepper to taste. Serve or refrigerate for later. Thanks Steph, I hope you do, it’s fabulous!! Is the quinoa measured before cooking it? I used 1 cup prepared quinoa and it didn’t seem like enough. The best quinoa salad ever! Definitely going to try this! Thanks for sharing! I have had this, and I can personally vouch that is is like the most amazing quinoa salad… EVER! Yummy! My sister, Cortney, LOVES LOVES LOVES salads like this! I’m for sure passing this recipe on to her too!! Thanks lady! This is awesome! 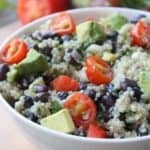 I’ve been looking for more quinoa recipes! The salad lasts well in the refrigerator but I would wait to add the avocados until you are ready to serve! Brought this to a bridal brunch and it was a huge hit! !